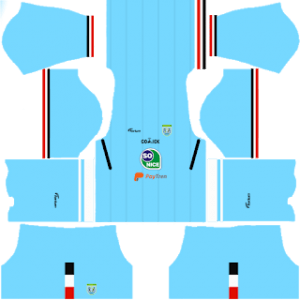 In this article, you can find and download Dream League Soccer (DLS) Persela Lamongan Kits and Logos 2018, 2019 Edition with URLs. Persela Lamongan is a professional Indonesian football club. The club was formed on 18 April 1967. Persela plays in the topmost division of Indonesian football which is the Liga 1. In most parts of Indonesia, the team is known by the name of Laskar Joko Tingkir which is their nickname. Surajaya Stadium is the home stadium of the Persela Lamongan football club. It has a capacity of 14,000 seats to acoommodate the visitors. Aji Santoso is the Persela Lamongan head coach and is training hard with the team to take them at the top. This was a small description of the team. You can download the Dream League Soccer Persela Lamongan Kits and logo from the article. All the Indonesian football fans will be looking for Persela Lamongan Dream League Soccer kits to use in the DLS 2018 football game. Good news for Persela Lamongan fans as the home, away and gk kits are available for the team. All the kits are available in the size of 512×512. The home kit is dominant in the blue color with few red and black stripes in it. The kit also consists of the sponsors’ name and the team logo. You can download this kit from below. 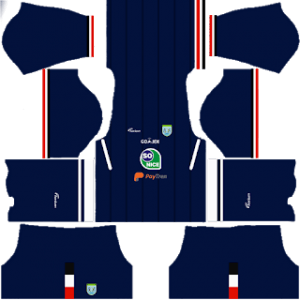 The Persela away kit is a dark blue color kit with red and white stripes on the edges of the t-shirt. This kit is used at the away matches played by the club. 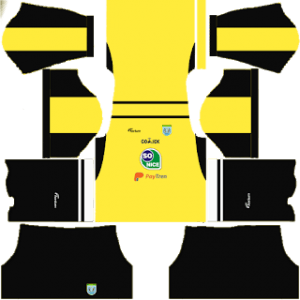 The Persela gk home kit is colored with partial yellow and black in color. The team’s gk uses the kit at the home matches played by the team. 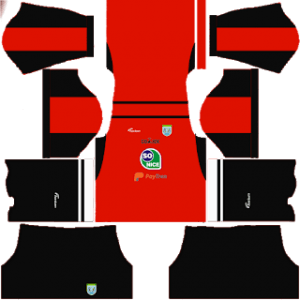 An attractive red and black kit to use in your DLS team. The kit also consists of stripes of white colors. Play with this kits by donwloading it from below. Every team’s logo changes a bit every year and the changes are hardly visible. The logo consists of two fishes in the center with Persela written at the top and Lamongan written at the bottom.